A mother's love knows no bounds, mothers would go to the ends of the orld to give their child the best. Even though no two people are the same on earth, it still feels like all mothers are becaus of how geniubely they take care of their family. 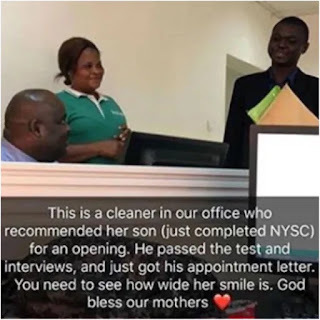 A photo of a woman who was smiling with pride after she was told her son got a job she recommended him for. 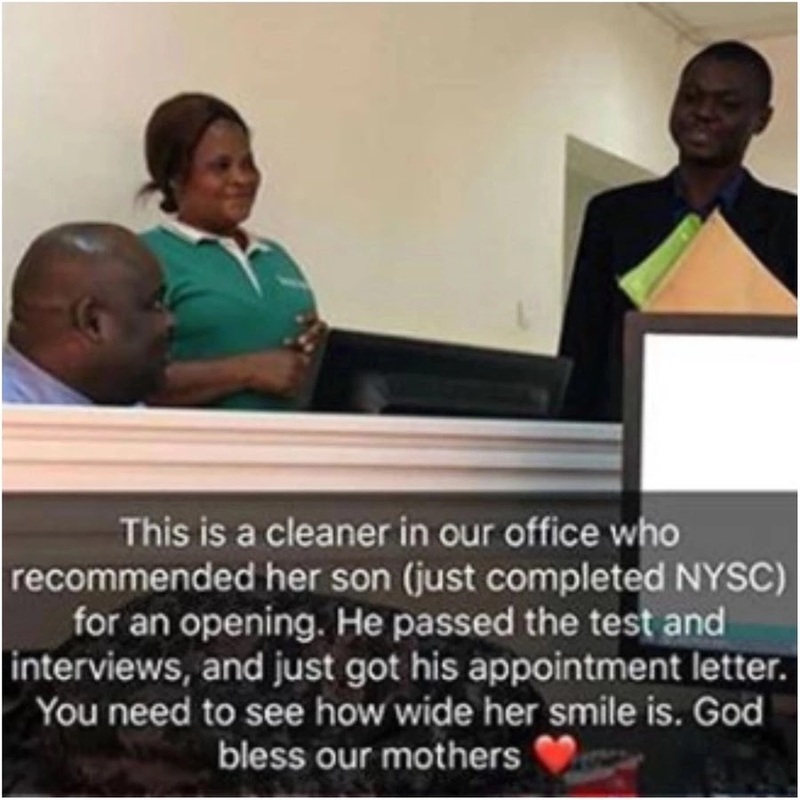 It was gathered that the woman who is a cleaner at an office recommended her son who just completed his National Youth Service Corps programme for a vacant position in the office she works. According to the family's story that was shared on Humans of Abuja, the proud mama identified simply as Grace was left a widow at her husband passed away. Grace revealed that life became difficult after her husband passed away, adding that ot became hard provide foe her two children. She noted that she sells groundnuts and work on a farm during the day just to provide for her children. She said: “My name is Grace. Life has not been easy since my husband died. I have two Children and providing for them alone is not really easy. Sometimes I just get tired of everything, but when I think about my children, I’m encouraged to work harder. I sell groundnuts during the day and go to work on people’s farm after. I work hard to train my children in school and I also try to make sure they are well fed and sheltered.” It was gathered that the photo that inspired lots of social media users was shared by an excited staff at Grace's place of work.